We report clinical course of a 22-year-old Indian male patient presenting with bilateral Juvenile X-linked retinoschisis (JXLRS) in response to topical 2% dorzolamide hydrochloride treatment. He presented with progressive diminution of vision in both eyes (OU) for the past 16 years. A “cartwheel” macular pattern was observed in his retina OU. Multimodal imaging including fundus photography, fluorescein fundus angiography, optical coherence tomography (OCT), and electroretinogram was performed. 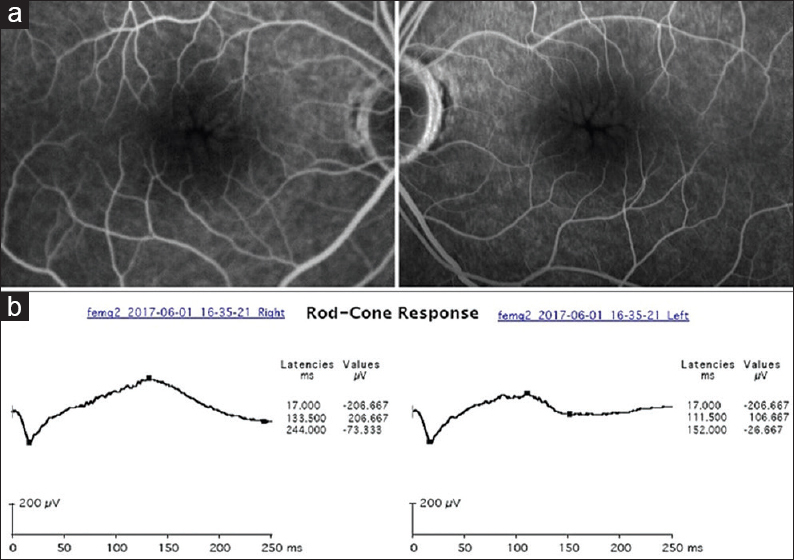 Following treatment with topical dorzolamide, there was a significant regression of the macular cyst on OCT and significant improvement in the visual acuity. This case report emphasizes on the response of macular cysts to topical dorzolamide. Thus, it may be a promising treatment option in terms of visual as well as anatomical recovery in JXLRS. Juvenile X-linked retinoschisis (JXLRS) is a relatively rare, hereditary, and bilateral cause of macular cystic degeneration in young men; affecting approximately 1 in 5000 to 1 in 25000. A “cart-wheel” (spoke-wheel and bicycle wheel) pattern of foveal schisis is the presenting clinical feature in all the patients and is typically associated with a gradually progressing visual loss. About 50% of the patients may have peripheral schisis. The use of carbonic anhydrase inhibitors (CAIs) in the treatment of JXLRS has been reported to reduce mild midperipheral schisis to a degree measurable by optical coherence tomography (OCT). CAIs act by acidifying the subretinal space and thus increasing fluid transport across the retinal pigment epithelium (RPE). JXLRS is a monogenic, autosomal dominant condition, caused by mutation in the retinoschisin gene (RS1) located on the Xp22.1 chromosome which leads to schisis in the outer plexiform layer of the retina. Retinoschisin is thought to play an important role in cell adhesion, maintaining the integrity of the photoreceptor-bipolar synapse and regulation of cellular fluid balance. Its mutation could be the cause of pathological extracellular fluid accumulation in the form of cystic cavities at the macula. We report a case of JXLRS in an Indian patient who presented to a tertiary eye care institute in North-East India with a significant improvement in the vision and anatomical configuration on OCT following topical CAI therapy. A 22-year-old male reported with progressive painless diminution of vision in both eyes (OU) for the past 16 years. The best-corrected visual acuity (VA) was 20/200 (OU), N18 right eye (OD) and N24 left eye (OS). There was no history of substance abuse or long-term medication intake. Family history was unremarkable. Anterior segment biomicroscopy was within normal limits. The dilated fundus examination with an indirect ophthalmoscope and +20 Diopter lens revealed bilateral isolated foveal schisis with a typical “cartwheel pattern” which was confirmed on fundus photography [Figure 1]. 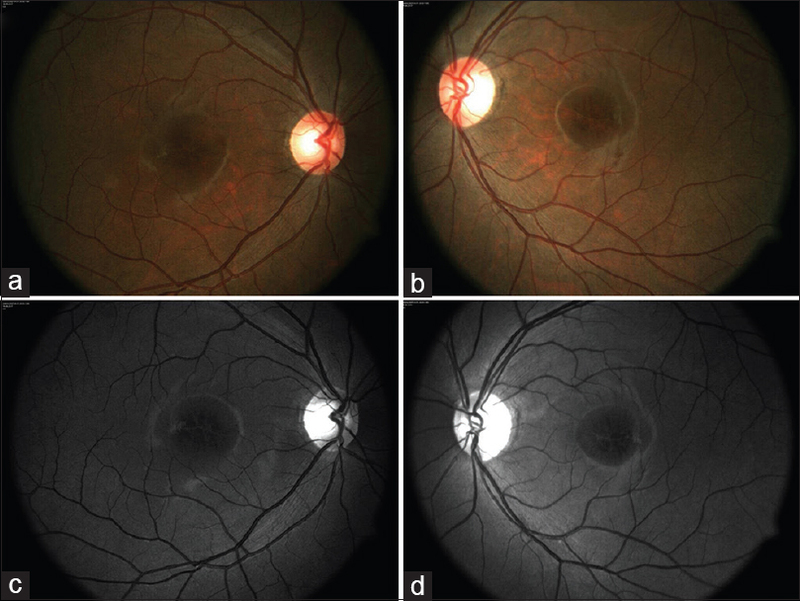 The OCT showed the presence of cystic spaces OU [Figure 2]a and [Figure 2]c. The central subfoveal mean thickness (CSMT) was 450 μm in OD [Figure 2]b and 426 μm in OS [Figure 2]d. Fundus fluorescein angiography (FFA) did not show intraretinal cystic filling and leakage at the macula OU [Figure 3]a. The electroretinogram (ERG) showed a subnormal scotopic and photopic response OU. Further, it showed the typical absence of b-wave and nearly normal a-wave (negative ERG) OU [Figure 3]b. On the basis of these findings, the diagnosis of bilateral JXLRS was made. He was started on topical 2% dorzolamide hydrochloride eye drops, one drop three times a day and was asked to review after 6 weeks. At 6 weeks' follow-up, clinically and OCT showed improvement with reduction in the cystic spaces [Figure 4]a and [Figure 4]c and the CSMT reduced to 190 μm OU [Figure 4]b and [Figure 4]d. Patient's current acceptance was −1.50 DS/−0.50 DC × 180° and vision improved to 20/32, N6 OU. The patient was asked to continue same medication and review after 3 months. The defective retinoschisin protein accumulates within and around the Müller cells resulting in the formation of cystic spaces in the retinal layers that coalesce to form large schisis cavities. Foveal schisis is anatomically located at the inner nuclear layer, and outer plexiform layer can be demonstrated on OCT. With increasing age there is structural loss of Müller cells leading to degradation. As a complication, few patients may develop macular atrophy. Goldmann-Favre syndrome, acquired retinoschisis, retinitis pigmentosa, Stargardt disease, cystoid macular edema, and exudative retinal detachment must be included in the differential diagnosis. Evidence of cystic spaces on OCT and b-wave abnormality in ERG points toward the diagnosis of JXLRS as seen in our case. The absence of macular leak on FFA further supplements the findings. Carbonic anhydrase is found in the RPE and photoreceptors particularly in cones and Müller cells of the retina. Recently, they have been used in the treatment of cystoid macular edema with retinoschisis and retinitis pigmentosa. The CAIs improve the retinal adhesiveness and enhance the function of the fluid transporter present in the RPE. Significant reduction in the macular schisis and a modest reduction in the mid-peripheral schisis have been demonstrated in eyes with JXLRS treated with CAIs as they improve the effectiveness of the RPE pump. The reduction in the macular schisis in our patient following topical 2% dorzolamide hydrochloride was remarkable in the initial 6 weeks and was accompanied by improvement in VA and macular thickness on OCT. This is consistent with the study conducted by Walia et al. which concluded that the response of macular cysts to dorzolamide in patients with JXLRS may be observed independent of the mechanism responsible for retinoschisin protein dysfunction. Thus, treatment with dorzolamide may be effective in patients with a certain type of dysfunction in retinoschisin. JXLRS should be an important differential diagnosis for bilateral poor vision in a young male. Topical dorzolamide is found to be good option for treatment in JXLRS. However, further studies are required on a larger scale with long follow-up to know the exact course of the disease. 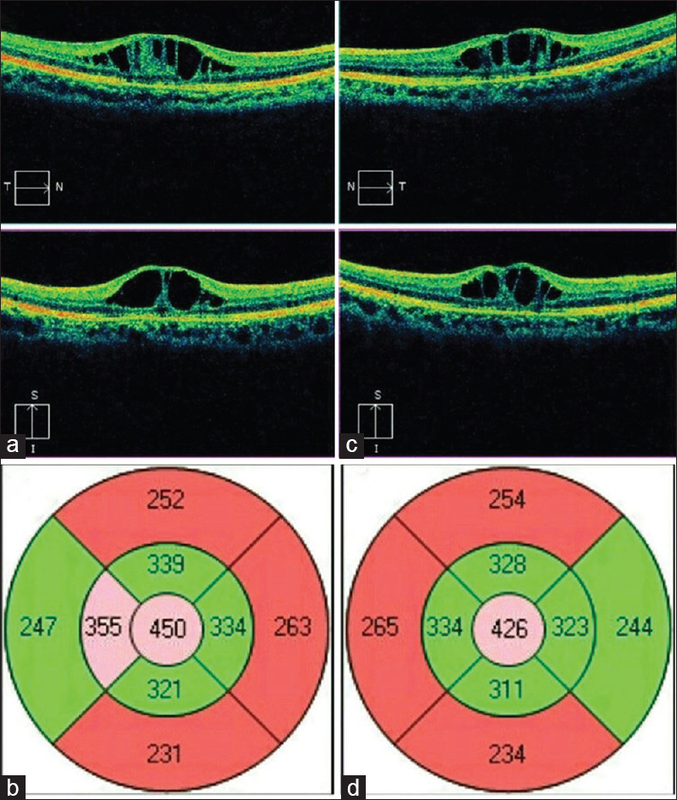 Neriyanuri S, Dhandayuthapani S, Arunachalam JP, Raman R. Phenotypic characterization of X-linked retinoschisis: Clinical, electroretinography, and optical coherence tomography variables. Indian J Ophthalmol 2016;64:513-7. Molday RS, Kellner U, Weber BH. X-linked juvenile retinoschisis: Clinical diagnosis, genetic analysis, and molecular mechanisms. Prog Retin Eye Res 2012;31:195-212. Collison FT, Genead MA, Fishman GA, Stone EM. Resolution of mid-peripheral schisis in x-linked retinoschisis with the use of dorzolamide. Ophthalmic Genet 2014;35:125-7. Rocha Cabrera P, Pareja Ríos AC, Cordovés Dorta L, Mantolán Sarmiento C, Serrano García MA. A combination of topical and systemic carbonic anhydrase in the treatment of chromosome X-linked retinoschisis. Arch Soc Esp Oftalmol 2014;89:320-3. Goel N, Ghosh B. Temporary resolution of foveal schisis following vitrectomy with silicon oil tamponade in X-linked retinoschisis with retinal detachment. Indian J Ophthalmol 2015;63:867-8. Yu J, Ni Y, Keane PA, Jiang C, Wang W, Xu G. Foveomacular schisis in juvenile X-linked retinoschisis: An optical coherence tomography study. Am J Ophthalmol 2010;149:973-8. 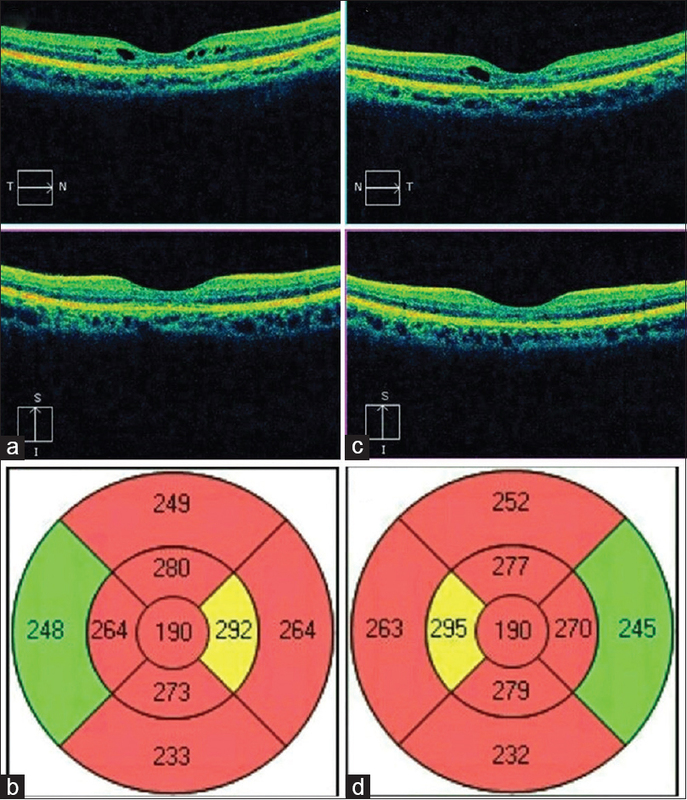 Menke MN, Feke GT, Hirose T. Effect of aging on macular features of X-linked retinoschisis assessed with optical coherence tomography. Retina 2011;31:1186-92. Genead MA, Fishman GA, Walia S. Efficacy of sustained topical dorzolamide therapy for cystic macular lesions in patients with X-linked retinoschisis. Arch Ophthalmol 2010;128:190-7. Sadaka A, Sisk RA. Dramatic regression of macular and peripheral retinoschisis with dorzolamide 2% in X-linked retinoschisis: A case report. J Med Case Rep 2016;10:142. Walia S, Fishman GA, Molday RS, Dyka FM, Kumar NM, Ehlinger MA, et al. Relation of response to treatment with dorzolamide in X-linked retinoschisis to the mechanism of functional loss in retinoschisin. Am J Ophthalmol 2009;147:111-5.